BAA's proactive comms and 'snow plan' at Heathrow have received a mixed response after Britain was hit by wintry conditions over the weekend. The airport’s comms department has reacted to the snowfall that swept the country by communicating that cancelling flights in advance would ‘minimise disruption’. Former BAA press spokesman Andrew Teacher agreed: ‘While the bad weather wasn't anywhere near as severe as 2010's episode, it was nevertheless a huge test for BAA. ‘Press-wise some took shots at BAA for cancelling flights in advance of snow. A lack of decisive action last time was one of the things people complained about and this time, with newly acquired powers at BAA's disposal to reduce flights, it successfully avoided people camping out at the airport. 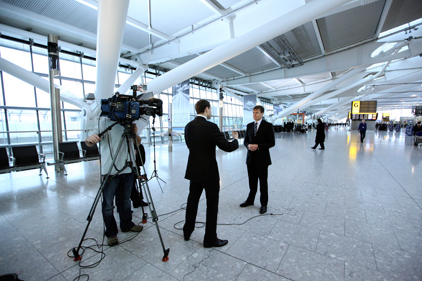 ‘Like many of the best CEOs under fire, Colin Matthews comes across with great stoicism and did a good job of communicating his real passion for Heathrow and for improving passengers' experiences during TV hits. Heathrow’s comms stance did not, however, prevent negative headlines, like the Daily Mail’s ‘It's snow-go Heathrow! -27C in Munich, but still every plane flies’, The Telegraph’s ‘Just three inches of snow halts half of all flights at Heathrow’ and The Independent’s ‘Thousands grounded as "snow plan" at Heathrow fails again’. Chris Lewis, CEO of Lewis PR, said that BAA’s anticipation of problems should be applauded but added that travellers needed more than just good comms. ‘Heathrow is definitely communicating better. The comms team anticipated the problems this time and did a lot to stop people piling up at the airport. I think this was appreciated. They've made better use of Twitter feeds and this is not just a legacy of last winter but of the ash cloud issues. BAA declined to comment on the media handling of the snow issues, telling PRWeek that it is not currently giving interviews. The praise for BAA’s comms handling comes as the Spanish-owned operator of six British airports, including Heathrow, is undertaking a multi-million pound comms review.